YARMOUTH COUNTY, NS—A proposed mink ranch development on Sloans Lake appears to be moving forward, much to the consternation of area residents who had been under the impression that the development application had been rejected under a municipal land-use bylaw. On October 28, 2009, following years of worsening lake conditions and the continuing proliferation of blue-green algae blooms, the Municipality of the District of Yarmouth (MODY) voted to amend a municipal land-use bylaw, increasing, from 328 to 500 feet, the required minimum setback distance from lakes and rivers for buildings, manure storage facilities, and burial sites for the disposal of dead animals used in conjunction with fur ranches and hog and fowl farms. An application submitted by R&N Farms Limited for a mink ranch development on Sloans Lake, roughly 20 kilometres north of Yarmouth, was initially denied because the development proposal did not meet the new setback criteria. But R&N revised its application to meet the demands of the revised bylaw and has since been granted 14 building permits for the same location. MODY Development Officer John Sullivan confirmed that the project is moving forward but could not give specific details. There has been much discussion over the last several years as to the source(s) of the excess nutrients that have caused blue-green algae t overrun several Yarmouth and Digby County lakes. Possible contributing factors include faulty lakeside septic systems and run-off containing agro-industrial fertilizers, but many residents of southwestern Nova Scotia believe under-regulated mink ranching practices are to blame, and the primary causal source to be improperly disposed carcasses, manure, urine and waste feed from mink ranches located near the Wentworth-Carleton headwaters in neighbouring Digby County. A report released in October 2010 by the Water and Wastewater Branch of Nova Scotia Environment (NSE) confirmed that several lakes in the region are showing increasing nutrient levels and deteriorating water quality due, at least in part, to nutrient inputs from human activities such as mink farming. 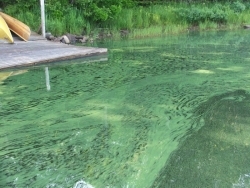 The blue-green algae, or cyanobacteria, that are thriving in many Yarmouth and Digby County lakes is a toxin-generating microscopic plant that flourishes in water containing high levels of phosphorus and nitrogen. The algae's prevalence has raised concerns about health and safety, reduced property values, damage to local ecologies and the proper regulation of industry. According to data cited by the Tri-County Watershed Protection Association, there is a pollution problem when total phosphorous levels in a lake have reached 50 micrograms per litre. A 2008 NSE water quality survey found total phosphorous levels in Placides Lake—a headwater in the Wentworth-Carleton watershed—to be 740 micrograms per litre at surface and 5200 at a depth of seven metres. On April 29, 2010, Nova Scotia Agriculture Minister John MacDonell introduced Bill 53, a legislative measure proposing more stringent governmental regulation of the province’s fur industry. The bill was passed the following week; draft regulations being developed under The Fur Industry Act are scheduled for completion in the latter half of 2011. Though acknowledging that The Fur Industry Act could be a step in the right direction, Hall remains skeptical. “There hasn’t been any apparent consultation with non-governmental environmental groups, the public, nor with water quality or nutrient pollution experts external to the government,” said Hall, referring to the content and thrust of Bill 53, and the process of drafting the regulations that are to comprise the Act. According to the province, the Nova Scotia mink industry generated roughly $80 million in export sales in 2009. One and a half million minks are raised in Nova Scotia each year on almost 80 mink farms, according to the CBC. Roughly 85 per cent of provincial production occurs in Digby and Yarmouth Counties. Steven is a writer from Harmony, NS. This article was originally published by the Halifax Media Co-op. Submitted by anonymous (not verified) on Tue, 2011-02-15 16:46. The govt should be ashamed to allow the destruction and pollution of SW Nova Scotia waterways for money. What will we tell our children when they ask what happened..any polluter should be shut down...and heavily fined. Tourists are not interested in looking at pollution..and they will not be able to enjoy any of this chain of lakes...is the tourist industry not worth preserving?? Our kids are losing their water playground...if it can happen here it can happen to your lake too! No doubt the taxpayer will be asked to pay. Some of these lakes cannot be saved!! Submitted by Mr. Truth (not verified) on Fri, 2011-09-23 20:22.
and several tank loads were spread over the fields. to pollute our land and waterways.